Ashwani Pareek | I.K International Publishing House Pvt. Ltd.
Ashwani Pareek was born in New Delhi, India, in 1969. Currently, he is an Associate Professor of Life Sciences at the Jawaharlal Nehru University (JNU), New Delhi. He obtained his B.Sc (Botany) and M.Sc. 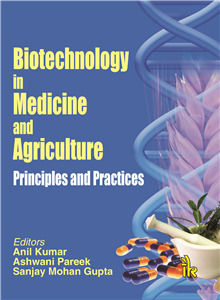 (Plant Molecular Biology) in 1990 and 1992, respectively, from the University of Delhi, India. He was introduced to the exciting field of Stress Physiology and Molecular Biology of plants during his Master’s thesis and his Ph.D. research work under the guidance of Professor Anil Grover at the Department of Plant Molecular Biology, University of Delhi South Campus (UDSC), New Delhi. His research work during Ph.D. focused on the analysis of heat shock proteins (HSPs, especially HSP90) and salt stress proteins (SSPs) in rice. After completing his Ph.D. in 1997, he worked at the laboratory of Professor Ralph S. Quatrano, at the University of North Carolina, Chapel Hill, NC, USA to learn “advanced plant molecular biology”, In 1998, he joined the laboratory of Professor Deepak Pental as a Research Scientist at Delhi University to work on herbicide tolerant Brassica juncea. Soon thereafter, he was appointed as a Lecturer at the newly established GGS Indraprastha University, New Delhi, India, where he played a key role in establishing the School of Biotechnology. After serving this University for four years, he was appointed, in 2003, on the faculty of the School of Life Sciences (SLS) at JNU. The main focus of his research has been towards an understanding of the signaling machinery in plants operative under osmotic stresses such as salinity and drought. He uses the tools of functional genomics, transgenics, bioinformatics and metabolomics to dissect out the cascades of events leading to these stresses in plants, especially the steps involved in “osmosensing”. During this period of research, he has highly benefited from collaborations with laboratories of Professor Hans Bohnert (at the University of Illinois at Urbana-Champaign, Illinois, USA), and Professor Roger A. Leigh (University of Cambridge, UK). Ashwani’s honors include: the Indian National Science Academy (INSA)-ROYAL SOCIETY (UK) exchange visitor’s fellowship 2005 (to work at University of Cambridge, UK); the BOYSCAST Fellowship by Ministry of Science and Technology, Government of India (2001); award of “The Rockefeller Foundation” Post-doctoral fellowship in the area of advanced ‘Plant Molecular Biology’ as a part of the ‘Rice Biotechnology Program’ to work in the laboratory of Professor Ralph S. Quatrano. He has been awarded Associateship from National Academy of Agricultural Sciences (NAAS) and he is also nominated a member of National academy of Sciences, India (NASI).